My first figures! The Selkie and the Pixie with a Pistol were done for the 2007 Frothers Unite sculpting competition. The theme was 'the Unseelie Suspects'. I was rather chuffed that the Pixie made joint 3rd in her category. 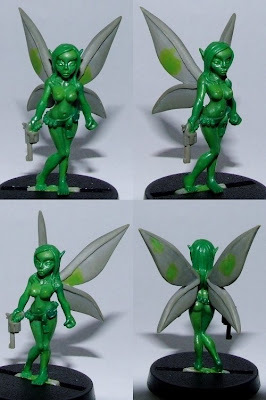 The Pixie was sold and may eventually be produced, but the Selkie was unceremoniously torn apart in order to make changes that were never completed.